Four Pennsylvania women will be heading to Washington, D.C., in January, breaking up the state’s current all-male congressional delegation and making history as the largest contingent of women the state has elected to federal office. Mary Gay Scanlon, Madeleine Dean, and Chrissy Houlahan will be representing the Philadelphia suburbs, and Susan Wild will serve the Lehigh Valley. All Democrats, they are part of a wave of victories across the country for women. 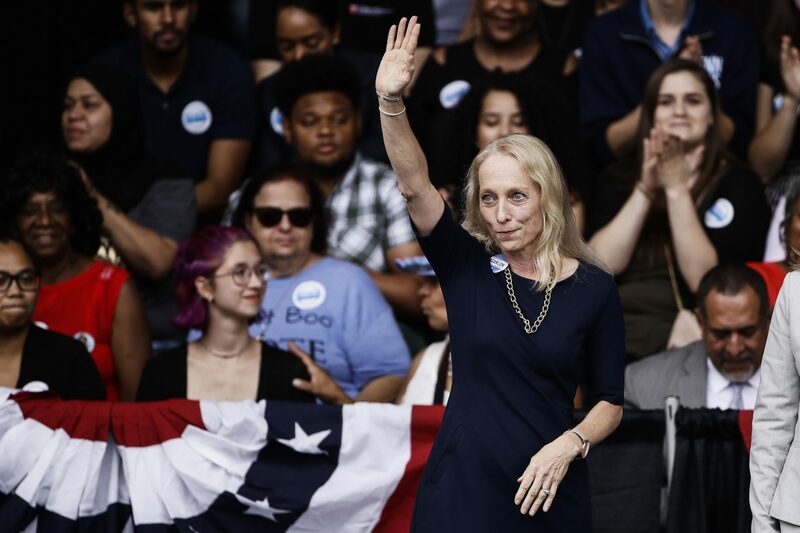 In a race that gave voters a rare choice of two women, Scanlon easily beat Republican Pearl Kim in the newly formed 5th Congressional District that includes Delaware County as well as parts of South and Southwest Philadelphia and Montgomery County. She said women jumped in off the sidelines to make themselves heard. “They’ve risen to the occasion in order to protest and push back against the worst impulses of this administration,” she said. Scanlon supporter Debra DiMasi grew up in Delaware County and says it’s changed. “Years ago I lived in Ridley. It was an interesting proposition to go the polls if you were anyone but a Republican. I couldn’t get a job at the county courthouse when I graduated high school, but the tide has turned.” She said Republican voters were coming up to her at the polls Tuesday saying they were frustrated with President Trump. Scanlon will be joined by Dean, who will represent the 4th Congressional District, which covers Montgomery County. Dean, an attorney, beat Republican Dan David. Businesswoman Houlahan will represent Chester County in the 6th District, beating Republican Greg McCauley. And in a tightly fought race, attorney Wild, who beat Olympic cyclist Marty Nothstein, will represent the Lehigh Valley in the 7th Congressional District. Many said they were motivated to run and volunteer on campaigns after the 2016 election of Donald Trump. The #MeToo movement against sexual harassment and the Brett Kavanaugh hearings for U.S. Supreme Court also may have spurred women to become more involved. Almost 100 years after women won the right to vote, some wonder why it’s taken so long for women to gain equal political footing with men. Marian Tasco has a few ideas. She served as a Philadelphia city councilwoman for 28 years as a Democrat, retiring in 2016. Her living room has an altar to her years of service — a picture of herself accepting an award from U.S. Sen. Bob Casey, a photo of the Obamas dancing at the 2009 inaugural ball. Tasco helped train women to run for office across the country in the 1980s, and some of those women are now in Congress. Tasco said men always had more access to wealthy donors because of their jobs and networks. But that’s changing, she said. 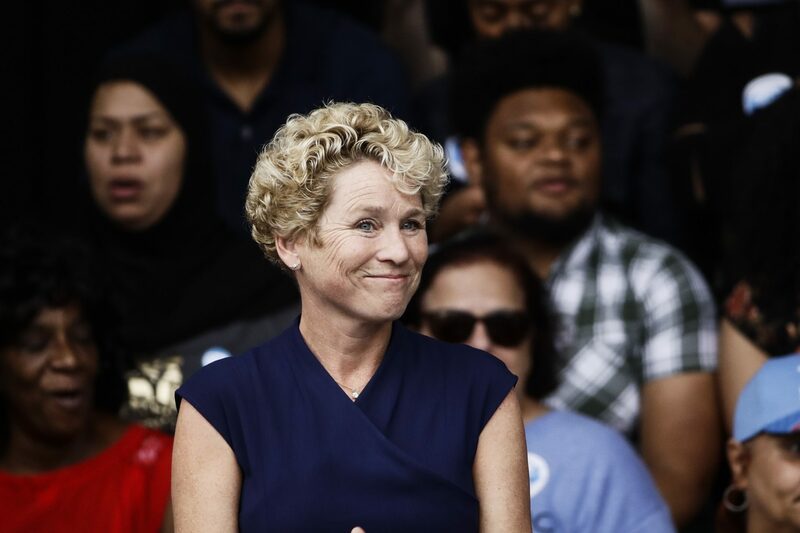 Democratic congressional candidate Chrissy Houlahan during a campaign rally in Philadelphia, Friday, Sept. 21, 2018. “So now women are beginning to go into the corporate world and have leadership roles. But you’ve got to have those connections, and you’ve got to be able to convince people that you can win,” she said. As an attorney at Ballard Spahr, Scanlon was able to tap a network of wealthy donors and contribute $300,000 of her own money to the campaign. Raising children also has held women back, Tasco said. Unlike men, women often wait to run for office until their children are grown. Kelly Dittmar, a Rutgers University professor and expert in gender and politics at The Center for American Women and Politics, agreed with Tasco’s analysis. Rutgers researchers have found women view the decision to run differently than men, she said. In fact, all the newly elected Pennsylvania women heading to Congress in January have adult children. And they all have advanced degrees — three are attorneys and one is an executive with a master’s degree from MIT. Research indicates that women also have different motivations for serving in office. They are more policy-oriented than men, Dittmar said. “So the shorthand is women run for office to do something, men run for office to be somebody,” she said. Women running in this midterm election may have been motivated by the loss of presidential candidate Hillary Clinton to Donald Trump in 2016. Allyson Schwartz was Pennsylvania’s most recent congresswoman. She represented Montgomery County and Northeast Philadelphia from 2005 to 2015 until she stepped down in an unsuccessful bid for governor. Before her election to Congress, she served in the Pennsylvania Senate. Schwartz said her work with health care policy and a passion to protect abortion rights motivated her to run for office. “Voters do need to see women being successful, and, as that happens more and more, voters will be willing to vote for women,” said Schwartz. Standing outside her polling place Tuesday in Jenkintown, Montgomery County voter Maxine Jackson said she voted for Dean because politics has been an old boys club for too long. Though the country will be sending more women to Congress, men will remain very much in the majority. That means newly elected women will have to be tough, Tasco said. At the end of the day, the women will need to work with the men on passing legislation, she said. WHYY’s Dana Bate and Annette John Hall contributed to this story. WHYY is the leading public media station serving the Philadelphia region, including Delaware, South Jersey and Pennsylvania. This story originally appeared on WHYY.org.